Fall will almost be here, and while the chill in the air is one way to know that my favorite season is upon us, I also can tell by the way my garden is behaving. In short, root vegetables are ready to eat! Roasting root veggies, which include everything from potatoes and turnips to carrots and beets, is a breeze. 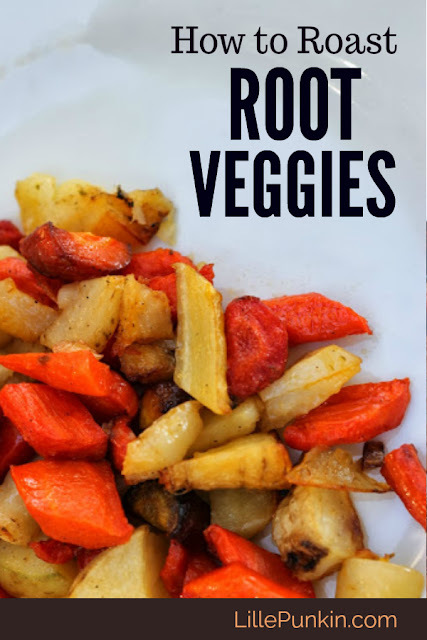 Follow this very simple tutorial (based off of a recipe I found in Better Homes and Gardens) to make a delicious and colorful side dish using ingredients from your garden or farmer's market. 1. Wash and cut your veggies into uniform chunks. For garden veggies, I leave the skins on. For carrots from the store, I peel them first. If your store-bought root veggie has a waxy coating -- as many turnips do - be sure to remove this first. Potatoes from the grocer will depend on the variety; thin-skinned or fingerling varieties don't have to be peeled first. Look for a colorful kind (like purple) to add more splash to your dish! It is also important to cut away any green part from your veggies; this is the part that was exposed to sunlight and can contain a toxin that you don't want to eat! 2. Toss your veggies in a mixture of 1/4 cup olive oil and your choice of seasonings per every 3 pounds of veggies. For seasonings, I prefer a teaspoon of kosher salt, a teaspoon of black pepper, and about 7 cloves of sliced garlic. You can also play around with fresh herbs such as parsley, basil, or sage. 3. Spread your coated veggies into a glass baking dish and bake for 45 minutes in a 400 degree oven. You'll want to stir the veggies once or twice during this time to allow for even cooking. If they aren't quite fork-tender after this time, feel free to leave them in an additional 10 minutes with the oven off. If you have an upcoming holiday dinner event, this is an awesome side-dish that most everyone will enjoy. What are your favorite root veggies?